Kayaking has long ago become a favorite water sport by many. Having the best kayak paddle will enable you to paddle for hours, even days, without getting tired. A combination of high quality materials and advanced technology will ensure your kayak paddle will perform as hard as you do. Finding a lightweight kayak paddle that will have the correct shape and design will allow you to go where ever you want with little effort. Kayak paddle reviews agree that having the best paddle will ensure you can travel the furthest distances with ease. We have found a list of our favorite kayak paddles on the market. 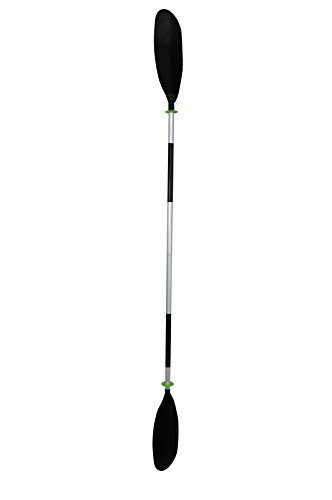 This is the best kayak paddle that is a long 96” that adjusts three ways for optimal use. It has a contour molded blade which helps propel paddlers easily through the water. A corrosion resistant paddle will allow you to go from salt to fresh water with ease. Drip guards on the paddle help to keep you dry. Long kayak paddles become easy with comfort foam grips. Transporting this paddle is easy as it disassembles into two pieces to easily fit in the trunk of your car. This is the best kayak paddle for fishing that has molded plastic blades. 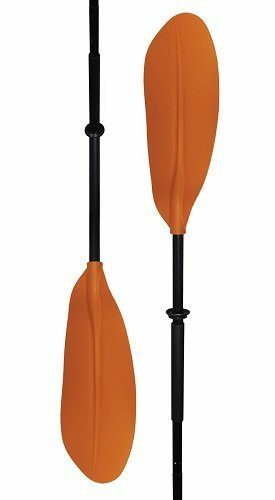 This two piece aluminum cheap kayak paddle carries a lightweight design allows this paddle to float in the water if dropped. With adjustable drip guards you can stay dry in the water. With foam rubber grips this paddle is great for long distance kayak paddles. This lightweight and ultra durable paddle is able to last you through many seasons. This asymmetrical spooned blade produces a powerful stroke great for long distance kayak paddles. 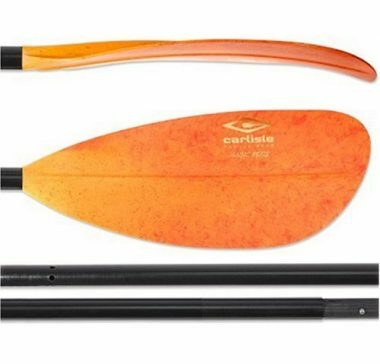 This is the best kayak paddle for the money that is available in multiple paddle lengths. This kayak produces a stiff and speedy blend with the flex and durability. A feathered blade with a support ridge design helps to glide you through the water with speed and precision. Collapsing into two pieces makes this paddle easy to store and transport. With adjustable drip guards, you are not going to get wet while paddling. Three locking positions are adjustable to fit more heights. The paddle floats which assures your paddle will stay close. This is the best budget kayak paddle that is longer and better comfort. Collapse this kayak paddle down into two pieces for easy transport. With a bent shaft this minimizes the amount of wrist flex during a stroke. The asymmetrical design is excellent for power strokes while the drip rings will ensure the water stays in the lake. A high tech glass filled polypropylene blade is lightweight while the smooth finish doesn’t add drag to your strokes. Two stylish colors ensure you will always stand out of the crowd. This is a high quality paddle for kayaks that will last for years to come. 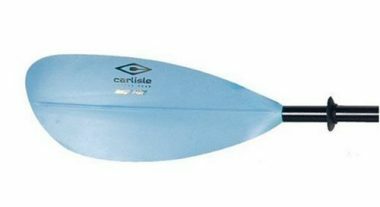 This is the best curved kayak paddle which can adjust the blade angle easily will allow you to use one paddle for many different applications. 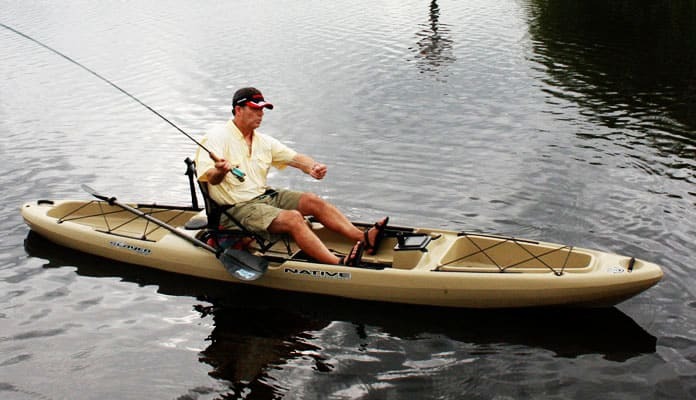 This fishing kayak paddle does just that. The AIRHEAD deluxe Paddle utilizes an aluminum design that is lightweight kayak paddle while being exceptionally durable. Being able to break this paddle into two pieces helps when finding a place to store it. Don’t worry about having to dive into the water to find this kayak paddle as it has been designed to stay afloat no matter what kind of water you are in. The Shoerline Marine X-II Paddle is the best kayak paddle under 100. The foam grip allows you to be as hard as you like on the paddle and not feel any shock through your arms. Thin blades keep the weight low while allowing very little resistance through the water. A handy addition of two drip guards will fight water that wants to crawl down the handles of this set. Coming in two sizes and color schemes this paddle will fit any person and rig combination. We recommend this paddle for water that is more still such as a freshwater lake environment. This is the best touring kayak paddle that comes in three different sizes. The Carlisle Day Tripper paddle will do its best to accommodate any sized paddler. Comprised of a highly durable polypropylene blade and an aluminum shaft this paddle will stand up to the elements and perform even under harsh environments. A quick release button allows you to go from a 60 degree feathered blade design to an inline paddle in seconds. This is perfect for kaykers who have left and right handed people in the family who want to share a paddle. Don’t be fooled by the inexpensive cost of this paddle, it is truly a high quality whitewater kayak paddle. Versatility is this paddles middle name. Do you have a kayak and a paddle board? This is the paddle for you. It comes in three pieces – a shaft with a blade attached, a t-grip piece, and a second blade. This ensures that no matter what your mode of water transportation is you will always have the correct paddle for the job. The SUP paddle can extend from 75 to 82 inches long, ensuring it fits nearly every sized person. If you are kayaking this paddle easily transforms into a 91 inch double sided paddle with a simple press to the stainless steel push button. The Seattle Sports Seawhisper is an excellent combination of high-quality materials for a fair price. This is the best carbon fiber kayak paddle that will allow you to power through the water with ease with its feathered blade design. The exceptionally high quality carbon fiber shaft ensures no matter how hard you flex it the paddle will bounce back. Two glass reinforced nylon blades create little resistance as you cut through the water like a hot knife through butter. All this coupled with little details like a leash loop ensures no matter where you take this paddle it will never leave your side. When buying the best kayak paddle there are many things you should consider before choosing the right one for you. When kayaking, your paddle is one of the most important things. Allowing you to propel through the water, this is a repetitive motion that will be much more comfortable when you have a higher quality kayak paddle that is designed for you. Depending on the type of kayak you buy, your personal height and your stroke style you should choose your kayak paddle accordingly. Most kayak paddles come with adjustable heights so that you can have the freedom to decide what works best for you. Generally, these are between 8 and 100 inches in length. As a general rule, the taller you are, the longer the paddle you require. The size of your kayak will be different depending on the style you get. 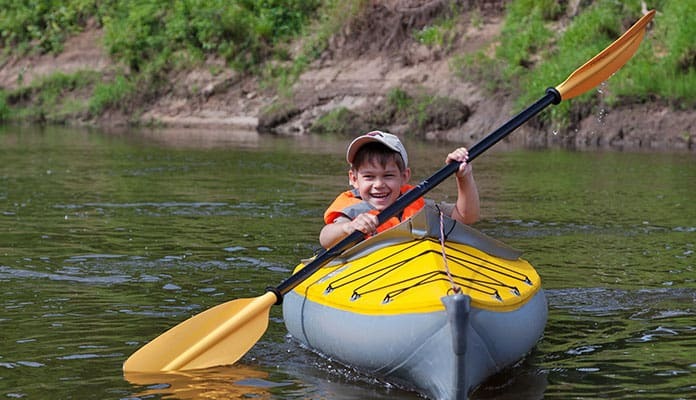 A recreational kayak will come in a range of 26 inches to 30 inches (66 to 76 cm) in width. Overall these kayaks are on the smaller size in both length and width. Racing kayaks will be designed for speed and nothing else. This means they will need to be skinny to reduce their drag through the water. Their width ranges from 19 inches to 22 inches (48 – 56 cm). If you are going to spend your time kayaking through rapids or white water the width will range between 22 and 30 inches (56 – 76 cm). 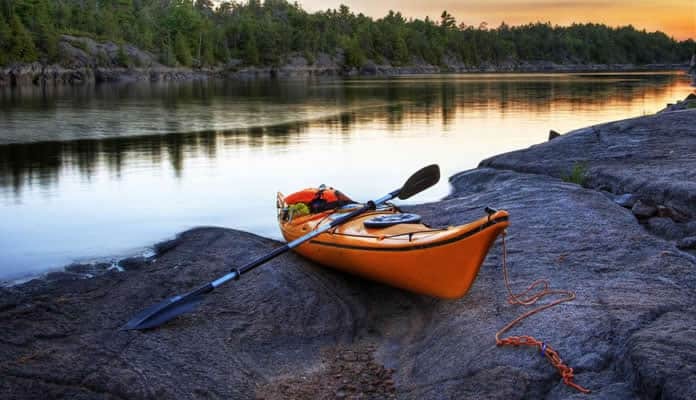 If you are wanting to spend weekends searching for the best beach campsite you can find, a touring kayak will be the one for you. These kayaks will have a width ranging from 22 to 26 inces (56 – 66 cm). Kayakers who are new to the sport should look for kayaks with a width that you’re comfortable with. Especially the sit inside type can make you feel closed in and having a wider kayak will lessen this feeling. If you have some experience or are looking for an option with more storage you won’t have a need to focus as much on the width of the kayak. When searching for your kayak just keep in mind that a wider kayak will also require a longer paddle. You may not think about it but your physique plays a role in choosing your kayak paddle. It is important to consider your height, weight and fitness level before purchasing your paddle. Generally speaking, athletic paddlers opt for shorter paddles that have wide blades which provide exceptional power with each stroke. Larger paddlers, those taller or heavier, should opt for a longer paddle that with a wide blade to deliver a slower yet efficient stroke. The opposite is true for smaller paddlers who will want a paddle with a smaller blade. In general when looking for a more powerful stroke you will want to opt for a paddle with a bigger blade. This will help scoop more water and therefore propel you through the water faster. Depending on your skill and the type of water you are paddling through, your paddle style is bound to change. Generally speaking, there are two different types of paddling styles out there. Low-angle paddling is as style generally done in calmer waters. These types of paddles feature horizontal thin blades that are generally longer in length. These efficient paddles help propel you through the water with ease making them ideal for longer distances or perfect paddle for kayak fishing. High-angle paddling, on the other hand, is more used by experienced kayakers tackling more challenging waters. This adventure kayak paddle is better for the fast moving water found in rivers and the ocean. They allow you maneuver swiftly through the water with a stronger force. These are also ideal for those looking to get into kayaking for fitness advantages. The blade of your paddle can be made from various materials. This aspect can also affect everything from your kayak paddle style to your endurance. For example, a carbon fiber blade will be lighter than a plastic one. Only a few ounces can alter your entry angle and how long you can paddle on your kayak without fatigue. A fiberglass blade will be among the most durable, lightest and strongest. If you have ever rented a kayak you will more than likely have used a fiberglass paddle. They are ideal for kayakers who just like having fun on the water. These paddles will perform better than plastic or aluminum as well. If money is no option for you a carbon fiber kayak paddle is the best you can get. It is the lightest option which will allow you to paddle the longest. But all of this comes at a price. It is one of the most expensive types of paddles you can get for your kayak. Beginners will appreciate the plastic, nylon and aluminum options available for paddles. These are all some of the heaviest options but will give you a great understanding of the basics of the sport. You can get your mechanics right and determine if you use your kayak enough to warrant upgrading to better gear. The shape of paddles has changed in recent years as the popularity of this kayak sport has increased. The previous symmetrical blades have been changed to a more popular and functional asymmetrical dihedral-designed blades. The scoop motion in this design is much more efficient requiring less energy and therefore makes this sport more accessible to many different kayakers. The shaft of your paddle is another item worth considering. There are two different types of shafts which ultimately come down to what is more comfortable for you as a paddler. Both having similar quality, straight shafts are generally more preferred amongst advanced kayakers. This is because it allows for more flexibility when maneuvering in a variety of different kayaking conditions. Bent shafts on the other hand are more preferred by recreational kayakers and those with less experience. This is because the bent shape adds comfort to the paddler’s wrists by reducing the strain during this repetitive motion. When buying paddles there are many things you should consider. Knowing why a kayak paddle is bent, for example, will help you when looking to upgrade your gear. You likely do not place much importance on the paddle that you select for kayaking. While some kayaks come with paddles, not all do. Oftentimes the ones that are included are not of the highest quality which may make it so that you want to upgrade later on. The kayak paddle that you choose can go a long way in determining the quality of your kayaking experience. For this reason, there are a few things you will want to think about before deciding on the ideal kayak paddle for you. Even those spending the most time out on the water have to come in sometimes. While storing your kayak can easily be done with the help of the best kayak storage carrier, you will need to think about storing the paddle as well. While you may think that this is easy to do, you will need to consider the size of your paddle and safety while storing. Storing your kayak for long periods of time with the weight on the blade can lead to it being deformed or uneven. This can negatively impact your time out on the water. They can also lead to your paddle tarnishing and getting scratches which can ruin its aesthetics. Luckily, many companies have considered this and worked towards looking for an adequate solution. Their solution: collapsible paddles. This allows your kayak oars to be broken down into 3 or 4 different smaller pieces when not in use. A great solution to the problem, this allows you to take apart the shaft of your paddle for easier storage and transportation. While this seems like the perfect solution, there are some negatives to this as well. The biggest being the rusting of the mechanics. This can make it hard for the pieces to be put back together. A great way to avoid this from happening is to always clean and maintain your kayak oars appropriately. Yet another potential issue with this design is that the more pieces there are, the more likely you are to lose one. Misplacing one of the parts to your kayak paddle will render your paddle virtually useless. This, again, can be easily fixed with the help of a simple elastic band and safe storage place. The type of water you are navigating through pays an incredibly crucial role in determining the type of paddle you choose for your kayak. While you may think we are talking about the temperature of the water, we are actually talking about the speed. As you may have guessed, navigating your way through white water rapids will be quite a bit more challenging than sitting back on a leisurely lake. For this reason, you will want a paddle that can produce more powerful stroke and work harder. A paddle that works harder will mean that you don’t have to. As the water you are paddling on changes, the type of kayak paddle you use should as well. When taking on rougher waters, such as those in a river, you will want a kayak paddle that is feathered. The strong angle on this type of paddle will allow you to cut through the air quickly delivering the fast strokes needed to maneuver in this type of water. Typically this type of paddle features a blade that is much wider but also quite a bit shorter in size. This type of paddle is only recommended for kayakers with some experience as they require a bit more work to master. Moving your wrist as you stroke will eventually come quite naturally but in the beginning can be a challenge. This will be something that can be easily learned with a little bit of practice. Most kayakers, especially those who are newer to the sport will want to head to calmer waters. Stiller waters found on a calm ocean inlet or o a lake require a much different paddle. Here you will find a kayak paddle with a lower angle much more beneficial to your overall efficiency. As this is more commonly the type of paddle produced, you will have an easy time finding the right kayak paddle for you. This type of water requires a less powerful stroke as you will not be fighting against strong winds and currents. This makes your kayaking experience much more leisurely and enjoyable. Knowing the type of water you plan to spend most of your time in will help you to decide on the right choice for you. Luckily, as kayak paddles are relatively inexpensive and you only need the one per person, it is easy to invest in multiple. Having both styles of paddles will allow you the opportunity to seamlessly paddle in any type of water. This is ideal for those who are looking to expand their kayaking experience or aren’t quite sure what type of paddle will work best for them. A kayaking paddle will differ from a paddleboarding one in that it has two sides of fins. Instead of using it as a canoe oar a kayaking paddle is used sitting down in a rocking motion to create thrust from both sides of the kayak. We recommend getting a paddle based on your kayak paddling style. Getting a paddle that has a different angle will allow you to do different things in the water with your kayak. For example, a low angled paddle will give you the ability to paddle for longer distances without too much strain. These kayak paddles will be a little bit longer than their counterpart with a more slender blade that allows you to fully extend through your stroke. A high angle paddle is designed for faster moving water where you need more force to move through the water. If you are looking for more of a workout on your kayak this is the paddle you should get. These will be slightly shorter and have bigger fins to create more thrust in the rushing current. The right paddle will work with your kayak to achieve the perfect paddling environment. Your height, the width of your rig, and the paddle style will be the determining factor of your paddle’s size. Refer to the sizing chart below for which size paddle you should get. Much like the actual kayak, a paddle will act differently depending on the materials used to make it. The most common material is nylon, aluminum or plastic. These can be relatively heavy compared to a higher quality material but will fit most kayakers budget. This material will stand the test of time and last for years. Fiberglass is not only used to create the kayak but also the paddle. This is a lightweight paddle option that is quite durable. Fiberglass paddles are mainly used for short to medium trips in moderately calm waters. The highest quality option is carbon fiber. There is no question about the durability of this material as it’s used on high end supercars. It may seem expensive, but your arms will thank you on the longer weekend kayak trips. The paddle’s blade is the main aspect of propelling you through the water to make the kayak go as fast as you would like. The design can either enhance or detract from your stroke making you have to work harder than you want on your kayak. Back in the day both blades were shaped in a symmetrical fashion. Nowadays blades have a more symmetrical oval shape. This creates a blade that can travel through the water easier and with less effort – both are things you will appreciate after a thousand strokes. This refers to blades that are not at the same angle as each other. Blades that are slightly angled differently to give you better control and movement through the water. One paddle enters and slices water while the other is angled perfectly to create less wind resistance when out of the water on your kayak. You may think that all kayak paddles carry the same design and are intended for the same use. This is actually quite incorrect. Instead, the type of paddle you choose should have a direct correlation to how you intend to use your kayak paddle. Most often the differences lie in the type of water you are paddling in. Calm still water requires less technology than rougher water with heavy currents. This difference makes it so that you require a different type of kayak paddle. Be sure to consider the type of paddling you will be doing before choosing your kayak paddle. Recreational kayak paddles will be designed to do everything well rather than one thing great. This means that the paddle will be on the larger side making it great for lakes and slower rivers. These will also be made from a more wide variety of materials. The paddle your kayak comes with will more than likely be a recreational style (unless you get a specialized kayak like a touring or competition style). It may also be a heavier option when compared to even a white water paddle. This will ensure the shaft will be able to handle more difficult water conditions. The only drawback is that it will be harder to paddle for a prolonged time. But if this is your first paddle you will be excited to use it to find out what kind of kayaking you like. You can use this time to try all the different aspects of the sport to find out which one you want to invest your money in. If you are into competing with your kayak you will need a special kind of paddle. You will need one made of the best and lightest materials. This will mean that the blades will be made out of fiberglass or composite material which makes them retain their strength while significantly reducing their weight. The shaft will also be made of a light yet durable material. The key to these kayak paddles is cutting as much weight as possible without sacrificing any of the durability or strength. A whitewater kayak paddle will need to be strong, lightweight and able to handle extreme water conditions. There are two different types of shafts for this type of paddle: straight and bent. The more common one is the straight option. If you have ever kayaked this is more than likely the type of paddle you used. It has the blades attached directly opposite each other in a symmetrical look. If you were to fold the paddle in half the paddle would be the same on both side. A bent shaft is more for people who have experience with kayaking and paddling. Just as the name implies the shaft has a slight bend in it which allows you to keep your wrists in a naturally bent position. This will put less strain on your body thus making it easier for you to paddle longer distances. These will cost a little more but if you plan on using your kayak a lot it will definitely be worth the money. The diameter of the shaft will vary depending on the size of your hands. Your kayak paddle should be able to fit in your grip comfortably without having you to grip it too strongly. A smaller diameter paddle will also weigh less but also be less strong than a thicker diameter option. 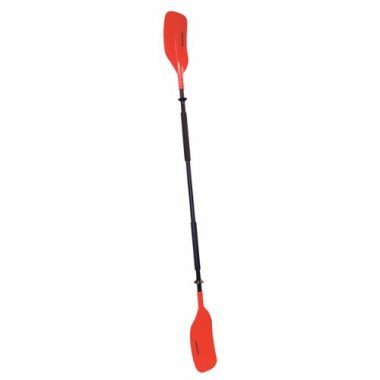 This type of kayak paddle can be quite similar to that of the white water, but at the same time is completely different (if that makes sense). There are both bent and straight options for touring kayak paddles but the blade size and paddle materials will be vastly different. The blade size will be based on personal preference. If you like to paddle quickly you will want a smaller blade. This will make it easier to move through the water and won’t weigh you down. The smaller blade size won’t slow you down since you move it more rapidly than other paddlers. A larger blade will be better for people who paddle slower. Since the blade will move more water it will take less effort to move at a pretty good speed. With that being said, it will be heavier but you will have to paddle less to cover a longer distance. Materials used to make touring kayak paddles will be higher quality than that of recreational ones. Touring kayaks are meant to travel longer distances which means even an extra ounce of weight will be magnified over time. If this sounds like what you might be after we suggest looking at a fiberglass or composite blade. They will cost more since the materials cost more, but it will allow you to paddle the distances you need to. Q: What Size Kayak Paddle Do I Need? A: The size of your kayak paddle will be mainly determined by your height. The width of your kayak also plays a key role in this calculation. For example, if the width of your kayak is under 23 inches (58 centimeters) it is recommended that your paddle be 210 centimeters (83 inches). At the same time, your height plays into this. For the same 23 inch kayak, if you are under 5’5” your paddle should be the 210 cm. If you are 5’5” to 5’11” your paddle will need to be 220 cm (86.6 cm), and if you are over 6’ the paddle you choose will need to be 220 cms 87+ cm) to fit your kayak. Q: How Do I Hold A Kayak Paddle? A: Kayak paddles have two blades attached by a long pole. To paddle efficiently your bum should be as far back in the seat as possible. Position your hands so that they are a little bit more spread out than your natural shoulder position. When you are trying to get the perfect paddle you will want to reach as far forward with that arm as you can and pull back using your legs to help as needed. Q: How Do I Steer A Kayak? A: Steering a kayak is quite a bit different than in a canoe. As many kayakers are in solo kayaks, you will be in charge of steering and propelling your kayak in the same motion. While this can seem overwhelming it is actually quite easy. Simply use a wide sweeping motion with your paddle. This will cause the bow of the kayak to turn away from your stroke pushing you into the direction you want. Q: Why Are Kayak Paddles Feathered? A: Not all kayak paddles are feathered but they really should be. This is the show of a high quality paddle. You may be confused by the idea of feathering but this really is a great feature. Kayak paddles differ from most other paddle powered water sports as the one paddle features blades on either sides. When a paddle is feathered, it simply means that the angle of the two blades are different. This is ideal to streamline your paddle. As one paddle cuts through the water to give you a powerful stroke, the other is at a 90° angle to cut through the air with minimal wind resistance. Most often this is done for ocean kayak paddles, as this is where you are likely to experience high powered winds. The angle of the paddle decreases the amount the paddle gets blown around and allows you a better control. The higher the angle that your paddle features, the less wind resistance you will experience. While not all paddles feature this technology, they really should. The first time you use a feathered paddle, you will likely experience quite a learning curve. This is because you will be required to rotate your wrist which will turn your paddle with every stroke. While this may be awkward at first, it does not take long to get used to the motion and it will come quite naturally. Alternatively, when winds are behind you and your paddle is not feathered, this can work to your advantage. Acting as a sail the wind will push your paddle helping you to propel forward. While this sounds nice, the moment you turn around you will experience a much more difficult time. Q: What Are The Different Types Of Paddles? A: There are nearly as many styles of paddles as there are types of kayaks. The type of paddles needs to be tailored for the specific type of paddling you’re doing. Usually this is broken down into 3 different categories including recreational, touring and performance. The most common is a recreational style paddle. These are great for beginners or people who only use their kayaks occasionally. They will have asymmetrical blades allowing them to be used in almost every water type. Some are adjustable in size but will typically range between 5 and 8 feet in length. If you usually go for longer trips with your kayak you will want to look into a touring kayak paddle. Every ounce counts when you’re paddling for hours in a day. This style paddle has been designed for more calm settings since the blades are smaller and symmetrical. People who are looking to compete or use kayaking as strength training will want a performance style paddle. These will be made from the lightest materials possible meaning you can paddle at your maximum for as long as you can. Q: How Should I Hold My Kayak Paddle? A: There is a correct and incorrect way to hold your paddle. Everything from the blade to shaft to size of the paddle has been designed in a certain way. Too many paddlers waste time and a lot of energy holding their paddles incorrectly. This simple mistake will make it so that your stroke isn’t efficient and ensure you work a lot harder. For that reason ensuring that you are paddling correctly is incredibly important. This all starts with how you are holding your paddle. When you pick up the paddle you will want to make sure the blades are facing the right way. You want the water to move behind you so make sure the curved side of the blade is facing towards you. Asymmetrical paddles should have the smaller side closest to the water. This will make them easier to get through the water when you’re paddling. To hold the paddle in the right way you will want to have your hands about shoulder width apart (or 9 inches from the center mark of the paddle). If you find this doesn’t give you the control you need you can widen your hands. It will give you the stability you are looking for to get even more power behind your strokes. Q: How To Size A Kayak Paddle? A: Most often, the size of your paddle should be determined by your height. While this is most often the primary focus, it is wise to also consider the of your kayak. If you have a wider kayak, say 38 inches, and you’re a shorter person you will still need a longer kayak paddle. Since the kayak is wide you will need to have a longer paddle that can accommodate that. A shorter paddle may not give you the length you need to have the right paddling dynamics. This could work to cause disruptions in your paddle and leave you with a less efficient stroke. If the paddle isn’t the right length you may find yourself bending and reaching in ways that can hurt your body. On the other hand if you are in a thinner kayak, such as a touring kayak, then you will likely require a shorter paddle. Be sure to primarily consider your height (ie your “wingspan”) and then consider the size of kayak you will be paddling. Q: What Kind Of Kayaking Do You Enjoy? A: This should be the first question you ask yourself. Are you planning on using your kayak for a short 2 hour paddle on a calm lake or are you heading for a bit more adventure? 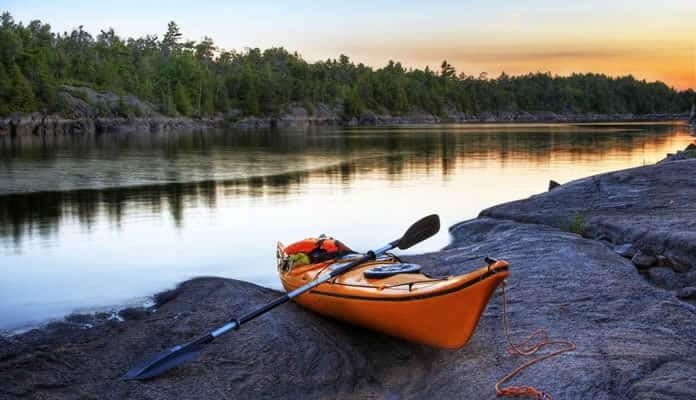 Using your paddle for white water rafting or taking on the strong ocean currents will require a much better paddle than simply paddling to the middle of a calm lake for some kayak fishing. When considering the type of kayaking you plan to do, be sure to think in the future as well. While you may stick to calm fishing lakes now, do you see yourself heading out on longer paddles as your comfort builds with the sport? When you are considering the type of kayak paddle, you should keep in mind that short trips to calmer lakes make for an easier paddle. This means that you can get a kayak paddle with less technology. Q: How Much Weight Can You Handle? A: Paddles will vary between 18 and upwards of 40 ozs. The use of these kayak paddles will differ depending on what you are doing. If you are just bombing around on the lake for an afternoon you will need a drastically different weight than if you are taking on the rapids in a fast paced river. It is important to pick up your paddle and get a good idea of the weight and size that is most comfortable for you. Most often this will vary from person to person depending on physique. Those who have quite a bit of upper body strength will generally prefer a paddle with more weight behind it. This will make the paddle feel better in their arms and lead to a more powerful stroke. On the other hand, a smaller paddler, either younger or one with less body weight, will likely require a much lighter paddle. Less body weight and muscle will make a lighter paddler feel more desirable. While no kayak paddle should be considered heavy, a lighter paddler will result in less arm fatigue allowing you to paddle for longer. This will do wonders to increase your comfort in the water. A lighter paddle in this instance will allow a lighter paddler to achieve a more efficient stroke. Q: What Type And Style Kayak Do You Use? 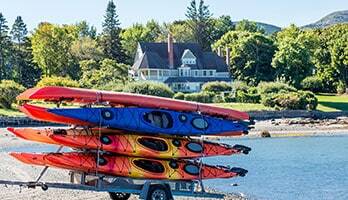 A: You may not realize but the different types of kayaks may require different paddles. Touring kayaks, for example, are long and sleek in design. The thinner kayak means that you will require a smaller paddle. In contrast, beginner kayaks tend to be a lot wider to increase stability for novice paddlers. For this reason, you may require a longer paddle to adjust for the kayak added width. To make it so that you can seamlessly go between different the different size kayak you may want to look into an extendable kayak paddle. This will allow you to use different size kayaks without having to have a special paddle for each kayak. When kayaking, especially for long overnight distances you need the best paddle. This will give you the most power behind your stroke propelling you further giving you the most distance. When you have a paddle that floats, you will ensure that your paddle will stay with you, even if dropped into the water. Having the best paddle will make your trip on the lake much more enjoyable. Love kayaking? What kind of paddle do you use? Chat with us about it in the comment section below.